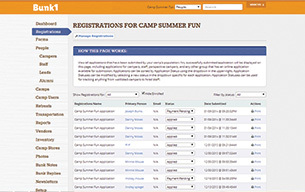 An All-Inclusive Camp Management Solution. 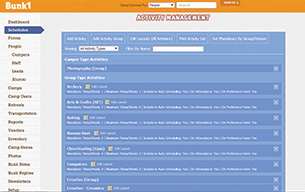 Intuitively designed, comprehensive, and customizable. As a camp director, you wear a lot of hats. You have to constantly juggle conflicting priorities with limited resources. The competitive environment has intensified, parent expectations continue to rise, children’s needs and concerns require more of your attention, and a new generation of staff is craving more frequent feedback. Isn’t it time you rewarded yourself and made your life a little easier? 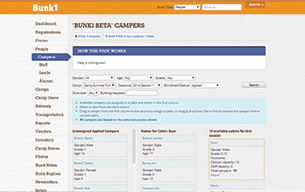 For a small investment, Bunk1 will help you to streamline your operation to improve efficiency, decrease the administrative burden, enhance communication with your customers, facilitate relationship building, increase marketing effectiveness, and provide your parents with a better camp experience.Our new, All-Inclusive Camp Management solution is elegantly designed by former camp and program directors. It’s modern and sophisticated, yet intuitive to use. 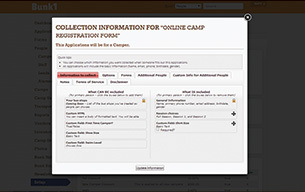 We understand how unique your camp is so we’ve incorporated maximum customization and flexibility. 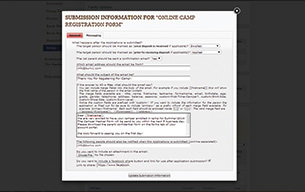 Sign up for a demo to see how 35 years of combined camp experience has led to the most profound approach to camp management. Simplify the experience for new and returning customers. 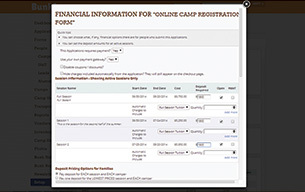 With our online registration, it’s easy for your website visitors to sign up for camp. Create as many custom built applications as you need and provide your customers with a user-friendly form. Edit your applications at anytime and preview before you make them available to your customers. We will even build your first application for you! 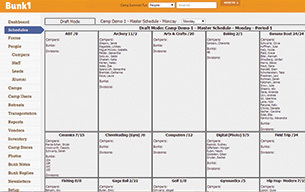 Camp Scheduling is a flexible, easy to use online system that helps organize your camp’s summer program and meet any scheduling needs. Define days, periods, activities, capacities, restrictions, etc. 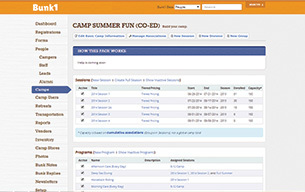 Create Cabin Assignments – With a simple drag and drop, you’ll be done with cabin assignments in no time! Run Comprehensive Reports – Get the information you need emailed directly to you without even logging into the system. 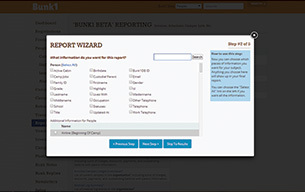 Set up Quick Reports to have rich reports at your fingertips. Customize your Database – With unlimited custom fields, your database can look exactly how you want it to. Hire Staff, Send Contracts & Monitor Salary Advancements – Use the same system for your staffing needs and have all records seamlessly integrated into your database.